After 12 weeks of rehearsals, the VocalEssence Vintage Voices choirs at Sabathani Community Center Senior Center (shown in the video above), Open Circle at Heritage Park Senior Services Center and Ecumen Seasons at Maplewood performed concerts at their respective locations; the concerts were free and open to the public with a reception following. 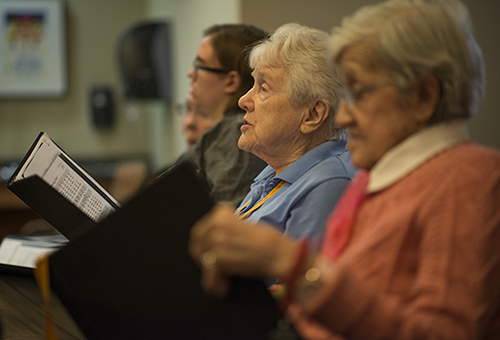 All were well-attended and an exciting culmination of this program that integrates the arts into the everyday lives of older adults by fostering the creation of choirs in assisted living facilities and senior centers. On May 21, the Sabathani Vintage Voices, featured in the video singing “I’ve Got Peace Like a River,” performed a wide variety of music, from Gregorian chant and spirituals to jazz classics. Joining hands, the choir and audience lifted their voices together in a spirited rendition of “We Shall Overcome.” The concert also featured several soloists, as well as members of the choir reciting poetry between musical selections. You can view the entire Sabathani concert below. On May 27, the Heritage Joyful Voices concert included selections of gospel, spirituals and jazz, including the world premiere of “Put the World Back Together” by singer and jazz legend Cornbread Harris, father of record producer Jimmy Jam, which was featured on KARE 11 News. On May 28, the Seasons Sunshine Singers of Ecumen Seasons at Maplewood delighted their audience with a mix of folk songs and jazz favorites. They proved that being in a choir is a life-long activity! These choirs have learned how fun it can be to sing a wide variety of vocal music. Conducted by Rob Graham, VocalEssence education manager and music librarian, with accompanist John Jensen, the singers have enjoyed not only the social aspect of being a part of a singing community, but also have learned new skills in healthy vocal technique and reading sheet music.